With more than 100 miles of paved and natural trails across Orange County, residents and guests have countless options when it comes to enjoying leisure outdoor activities. Orange County Parks and Recreation continues to expand that number with the recent opening of Phase 1, Segment 1 of the new Shingle Creek Trail, just south of W. Sand Lake Road towards Destination Parkway. The Shingle Creek Trail is part of a larger multi-county, multi-jurisdictional trail network. Once complete, various parts of the trail will connect Orange County, the City of Orlando, Osceola County and the City of Kissimmee. Shingle Creek is the top-priority trail in Orange County’s Trails Master Plan. Phase 1, Segment 1 of the County’s portion of the trail costs $1.56 million and is federally funded and administered by the Florida Department of Transportation. The trail segment is one mile long and features a 14-foot wide path, a rest area, benches, a bicycle rack and trash receptacles. Phase 1 will include two additional segments that will continue the trail south to Central Florida Parkway. Future phases of the trail will include expanding towards the Osceola County line and connecting to Town Loop Boulevard, the Pine Hills Trail and the City of Orlando’s existing Shingle Creek Trail network. In total, Orange County’s portions of the trail will stretch an estimated 9.3 miles. When fully constructed, the trail will connect with the statewide Coast-to-Coast Trail, a centerpiece in Florida’s developing eco-tourism puzzle that will help attract millions of visitors to Central Florida. 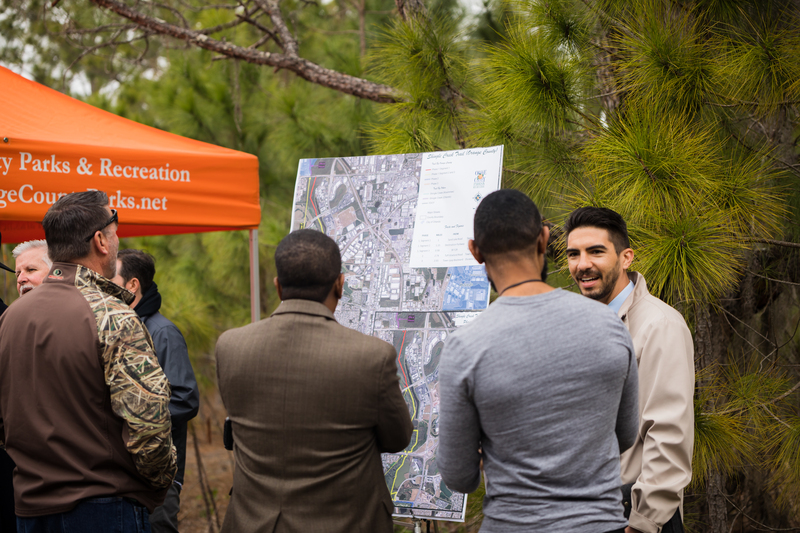 Photo Caption: Residents and community leaders view master plan of Orange County portion of the Shingle Creek Trail at the Ribbon Cutting Ceremony on Wednesday, Jan. 30, 2019.